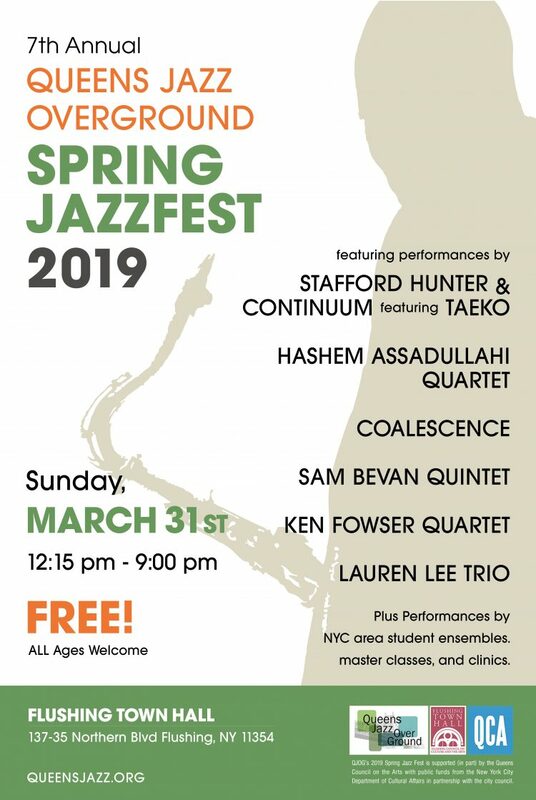 New York, NY (February, 2019) – The Queens Jazz OverGround, a collective that promotes jazz performance and education in the borough of Queens, will present our 2019 Spring Jazz Fest, a free, daylong series of jazz workshops and performances. All events will take place at Flushing Town Hall on Sunday, March 31st from 12:15 pm – 9:00 pm, 137-35 Northern Blvd (corner of Linden Place), Flushing, NY. The Queens Jazz OverGround’s 2019 Spring Jazz Fest is supported (in part) by the Queens Council on the Arts with public funds from the New York City Department of Cultural Affairs in partnership with the city council.